Shifty Jelly, makers of popular podcasting app, Pocket Casts, released version 5.0 of the app this afternoon. The update, as you may have been anticipating, is the big Material Design makeover you have all been waiting for. The new app is fit with animations, rippling touches, and layers upon layers of sliding panels. It’s very well done. Along with the Materialyolo-ness, you can also swipe episodes to mark them as played/unplayed, will find new audio effects for Volume Boost and Silence Removal, and the Up Next list now in mini players. The update appears to be live for all, so go grab it! And subscribe to the Droid Life Show. 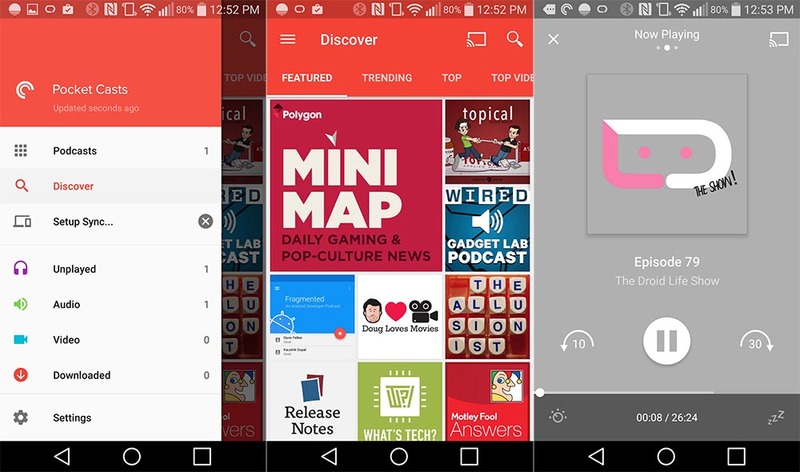 OMG Pocket Casts turns 5.0! Swipe episodes to mark as played/unplayed. Viva la revolución! New Audio Effects: Volume Boost and Silence Removal. If you can’t guess what the first one does then you’re beyond help. Up Next list now in your mini player, swipe across to see what’s coming up and quickly add more. Update: Here is a blog post from Shifty Jelly that talks about all that’s new in the update. What's New in Android 5.1? Here are a Few Things.